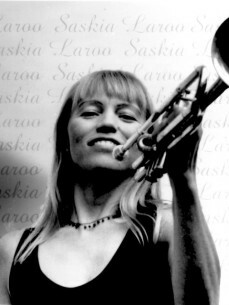 Saskia Laroo, hailed by American public and press at large as "Lady Miles of Europe", is one of the few women trumpet stylists, blowing for more than three decades. Born July 31, 1959 in Amsterdam, she began on trumpet at age 8, never dreaming of becoming a professional musician. That all changed when Saskia, turned 18, after briefly majoring in mathematics at University of Amsterdam switched her focus to a career in music. She worked extensively in various groups from this point, at first mostly on upright bass, though eventually, on both bass and trumpet; the trumpet became her main instrument. Saskia Laroo combines today's music by uncontrived romps into new styles, eagerly limned as "nu jazz" or "swingin' body-music"--a vivacious blend of hip-hop, jazz, salsa, funk reggae, and world, that many other artists dare not venture. Her artistry and her groove ring vibrantly and free on her six albums journeying us through the music she has absorbed and plays from heart and soul.